Situated on Kings Avenue in the very heart of Kato Paphos, the DOWNTOWN SUITES is a remarkable new building. The architecture is a modern take on a fusion of concrete, wood, marble and bronzed aluminium, carefully crafted to both complement, and contrast with, its surroundings. Inside are sumptuous, contemporary apartments which have been designed without compromise and built with the utmost attention to detail. Most boast outdoor space,some on a spectacular scale, and many offer breathtaking views over the lighthouse and the Mediterranean Sea. The 2 and 3 bedroom apartments and Penthouses at the DOWNTOWN SUITES offer a perfect blend of indoor and outdoor space, combining generous amounts of interior space and, in many cases, extensive terraces. 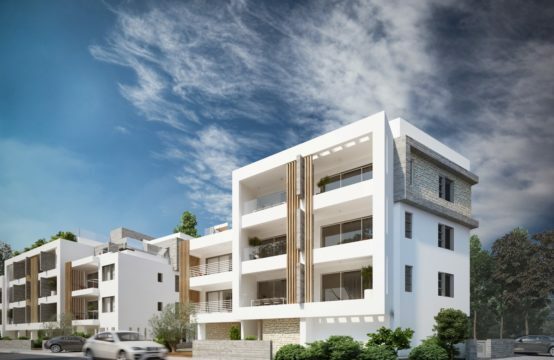 Located on floors one to three, these beautiful homes are available on all four orientations of the building, offering a choice of outlook: overlooking either Paphos town, Kings Avenue Mall or the Lighthouse beach. Every apartment – indeed, every room – has been carefully designed to offer a high degree of flexibility, providing the perfect venue for either relaxing or entertaining. Full length floor to ceiling glazing capitalizes on both the natural light and the striking Paphos views outside. The combination of its location and the architect’s vision means the DOWNTOWN SUITES building has a unique footprint: very few homes share a common layout, and almost every one has its own, unique, character. Every property at the luxurious DOWNTOWN SUITES comes with a top end specification. Only the finest materials and finishes are used, from italian-made kitchens to marble floorings, beautifully elegant bathrooms and sumptuous living areas. The highest quality materials and a scrupulous attention to detail are evident everywhere.